An extensive and thorough book about everything related to the german dictatorship - from 19th century ideas that were the root of the nazi ideaology to after the end of WW2 and beyond. At first I had my doubts about the writer serving in the vermacht himself during the war and how that might effect his writing, but this is an educatinv and well-written book. This book waws pretty good. I personally like books on World War Two, and this one was very educational like. It says, pretty much, everything that happened during Adolf Hitler's reign. It's kinda hard to get into and to people who don't like educational.. do not read!! "GERMAN DICTATORSHIP, The Origins, Structure, and Effects of National Socialism by Karl Dietrich. 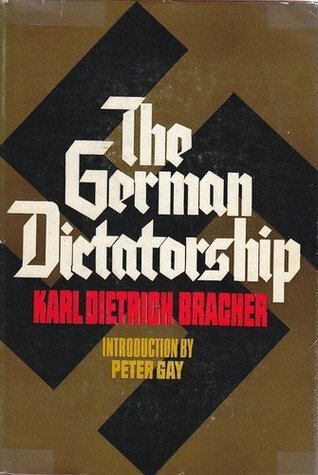 Translated by Jean Steinberg Bracher (1970)"
Karl Dietrich Bracher Jean Steiberg Peter Gay - Karl Dietrich Bracher was a German political scientist and historian of the Weimar Republic and Nazi Germany. Born in Stuttgart, he served in the Wehrmacht during World War II and was captured by the Americans while serving in Tunisia in 1943. He was then held as a POW in Camp Concordia, Kansas. He was awarded a Ph.D. in the Classics by the University of Tübingen in 1948 and subsequently studied at Harvard University from 1949 to 1950. During World War II, Bracher taught at the Free University of Berlin from 1950 to 1958 and at the University of Bonn, where he was a professor of politics and contemporary history from 1959 to 1987. Bracher married Dorothee Schleicher, the niece of Dietrich Bonhoeffer.